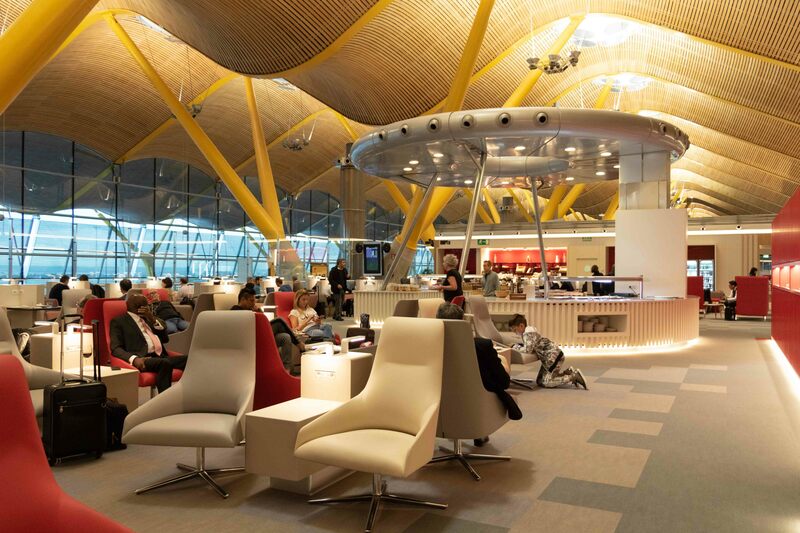 After the year upon completion of the Premium Velázquez Lounge at Terminal 4 Satellite at Madrid-Barajas Airport, the Dalí Lounge at Terminal 4 just opened its doors to the public. It’s a privileged space for a couple of reasons: one, it’s located right next to the Security Checkpoint, and two, it offers exceptional views of the platform and the terminal’s spectacular interior. This VIP Lounge designed for Iberia continues along the airline’s modernization. It offers an ample space of 2,000 square meters with 455 comfortable lounge seats – a hundredfold of its area and capacity. Besides increasing its space, the renovation has also improved the interaction with the passengers. The reception is next to the Air Bridge that assists the clients’ transit. The most unique aspect of this renovation is the restructuring of the central areas where the circular islands of the self-service food bar are located, an authentic centerpiece of the display. The preexisting “flying saucer” over the hall that holds the air-conditioning ducts has been kept for its uniqueness. In the newly renovated Premium Dalí Lounge, passengers can revel in the luxury of its facilities: five showers (one of the most demanding services), plentiful of beds that offer privacy for rest, and other facilities such as unlimited wi-fi. Additionally, each lounge seat has a USB connector and an outlet for any type of electronic gadget. Gastronomy is one of the services offered, one of the trademarks of the Lounge. Its 120-square-meter wine bar offers a premium selection of 22 distinct wines that come from different Spanish designations of origin. This space has also been designed to separate two areas: The North, destined for businessmen running short on time who need all services within arm’s reach; and the South, designed for those who have time to spare. The children’s game room can be found in this part that offers all sorts of entertainment for the young: a TV, an Xbox, and board games. The showers are located here too. The Premium Dalí Lounge carries the name of the Empordà genius for his historical relationship with Iberia. In 1972, in an exercise that could well be called “surrealistic anthropometry”, he created two paintings for the airline which flew on the company’s famous DC-10 aircraft. The works –Pastor del Ampurdán and Sirena Alada de la Costa Brava– were created with acrylics on vinyl.